Early on in the picture, the founding members of Oasis discuss their first gig. How these guys from Manchester hired a van they planned to drive to Glasgow, and sleep inside overnight, in order to play a gig for seven people. Cut to three years later, where the band performed to a quarter of a million people, over two nights. The rapid rise to stardom was unprecedented, and is accurately captured in this picture. Considering the time period, it's quite astonishing how much footage there is. From fan recordings to television interviews, there's a large amount for the filmmakers to choose from. Where footage hasn't been available, director Mat Whitecross has utilised an eye-pleasing style to showcase photos, drawings, recordings, and other assembled pieces to compensate. The frank nature of the interviewees makes for a refreshing change of pace, as well as making this one of 2016's funniest films, by far. But this doesn't mean the film, nor the interviewees, shy away from the tough topics. The members are open about it all, be it their US concert where the band were on Crystal Meth, the sacking of original drummer Tony McCarroll, or a destroyed recording studio which led to Noel attacking Liam with a cricket bat. But the film never loses sight of what's important to the band, which is the music. An early recording of Live Forever is a great example, showcasing how much the music means to these guys. This is especially true for Noel, who's depicted as holding a real appreciation for the music from an early age. The tale comes to a close at the Knebworth gig in 1996, leaving the picture on a high note for the band. An argument can be made for the documentary continuing onward, detailing the later years and the eventual fall out of the band. But leaving out this aspect may just have been the best decision made by Mat Whitecross, as the focus lies on the bands rapid rise to stardom, eschewing from the typical rise and fall formula. 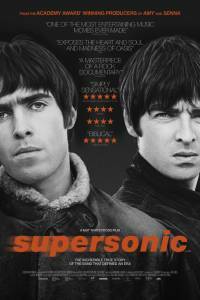 Supersonic manages to deliver the story of Oasis and their rapid rise to stardom stupendously, in a manner both candid & hilarious.